The “red, white, and maple leaf” flag is now recognized around the world as a definitive symbol for Canada. The National Flag of Canada celebrates its 53rd birthday in 2018. Whenever I’m back in Canada, I always get a warm feeling when I see the English and French signage in our airports or train stations, and the the red, white, and maple-leaf flag flapping in the wind. The sight of the flag tells me I’m home. I’ve often asked myself: how old is the Canadian flag? Has the flag been around as long as the nation? Does Canada have a day to celebrate the flag? Since 1996, the National Flag of Canada Day is observed annually on February 15. One might assume the Canadian flag has been around as long as the nation took shape in confederation, created by the legislation of the “British North America Act” in 1867. However, the current version of the Canadian flag with its 2-to-1 length-to-height ratio, a red stripe on each side, and a stylized 11-point red maple leaf on top of a white square in the centre made its first official and public appearance at Ottawa’s Parliament Hill on 15 February 1965. 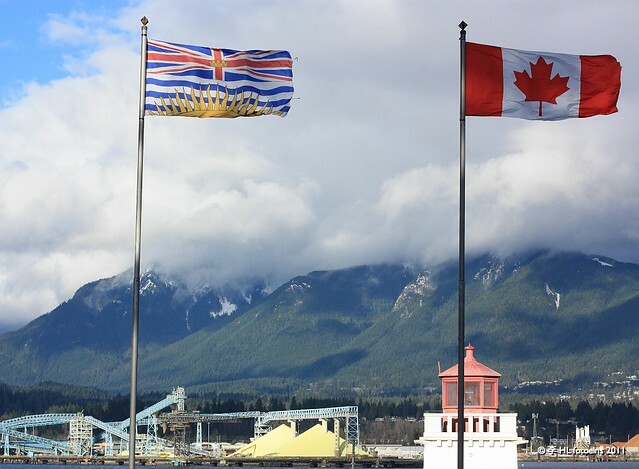 As red and white had already been declared the official colours of Canada in 1921, the red stripes reflect the Pacific and Atlantic Oceans which border the country at the western and eastern ends, respectively, referring directly to the Latin inscription in the Canadian Royal Coat of Arms, “A Mari Usque Ad Mari” (from sea to sea). With roots dating back to the British empire and membership in the British Commonwealth since 1931, there was criticism and controversy about eliminating the “Union Jack”, as the Canadian Red Ensign had been in common use for decades. The new design was based on the flag for the Royal Military College in Kingston, and drew in representative elements of the young nation. Key figures in today’s Canadian flag include then Canadian Prime Minister the Right Honourable Lester B. Pearson who wanted a distinctive national flag to promote national unity and risked his political career over strong objections to removing the British red ensign; John Matheson who was a member of a non-partisan parliamentary committee tasked with choosing a new flag; and Dr. George Stanley who was Dean of Arts at Kingston’s Royal Military College and provided the key concepts of the red-white-red design and a central red maple leaf. a rallying symbol and unifying force. Stanley also sketched one of the first appearances of the flag in the memo. The reader can ask themselves whether all of these have been achieved with the modern flag. 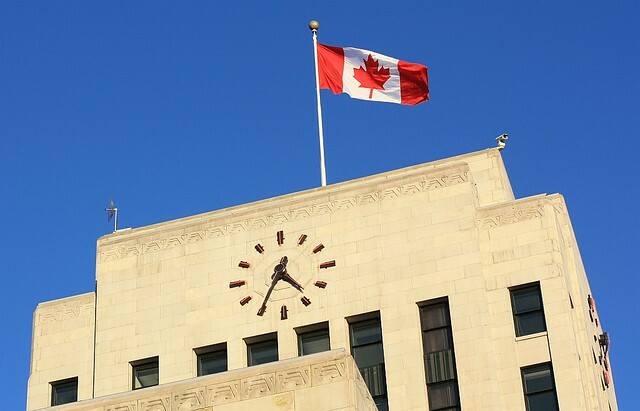 • If you’re in the downtown or central business district of Vancouver, 12 noon is marked every day by the first four notes of the Canadian national anthem, booming out from the Heritage Horns on top of Canada Place. The picture of the Canadian flag at the very top was obtained after a Google search for Creative Commons images. I made the remaining photos on these dates: Brockton Point on 7 January 2011, Beach-Davie-Denman triangle on 5 January 2012, City Hall on 13 February 2012, and the rest on 10 February 2013. This post appears on Fotoeins Fotografie at fotoeins.com as http://wp.me/p1BIdT-326. I miss hearing those horns at noon! Hi, Tim & Nat. I was born and raised in Vancouver, and that’s been a significant amount of time in the city, but I always took those noon-horns for granted. It sounds stupid and obvious now, but I really missed them, which hit me hard whenever I came back into town and happened to be within earshot of those horns at noon. 🙂 Thanks for your comment! When I lived in Canada, I was impressed by how discrete the flags were (in size). You know that in my country we are fond of monumental flags. I still have a Canadian flag that my friends gave me as a parting gift. It is one of my favorite flags on earth, very pretty. Happy flag day Canada! Hi, Eva. I never fully realized that about the flag until you mentioned it just now, and I often forget you lived in Montreal! 🙂 Canada is a young country, and the decision made to create the present flag were interesting choices. I had forgotten that the “official dimensions” of the flag were 2-to-1 with its central square, which would explain why I’ve always enjoyed the “clean and simple symmetry” of our flag. I’m glad you have one of our flags, too. 🙂 Thanks for reading and for your comment, Eva! Love all the pics of the Canadian flag! I always forget that Feb 15th is Flag Day – we have “Family Day” weekend in Ontario this weekend and there was discussion before it was implemented of having a long weekend in February for Flag Day – would have been nice to have a holiday to celebrate our flag! Hi, Lisa. Thank you for your kind compliment! Given how BC celebrated its Family Day this past Monday (just to be different from other provinces! ), I don’t think having a long weekend would work across the country, as the various provinces would have to agree to having Family Day on the same calendar day, although I like the idea of a “long weekend” stretching from Flag Day clear through to and including Family Day. Thanks again for reading and for your comment! I had no idea we had a National Flag Day, very interesting. I love the photos. The one of Granville Island at the end is fantastic. Hi, Alouise. Thanks for your kind words; I enjoyed making thise photos. At the risk of sounding “too patriotic”, I think sometimes we’re all too Canadian and the flags come out only when we win a gold medal in hockey. 😉 Our flag is a universal symbol, one that any Canadian traveler would know recognition occurs just about everywhere. Thanks again for reading and for your comment! Thanks, Emiliano, and cheers from Canada to you in Italy! I grew up about as far away from you as you can get without leaving the country (Nova Scotia) and I love the similarities that we share! I remember noon-time horn, too!? One of my best friends from elementary school’s birthday is on Flag Day. Now I can’t forget her birthday because it’s Flag Day, and I can’t forget Flag Day because it’s her birthday. I don’t even talk to her anymore, and I still remember her birthday! I’ve spotted Canadian flags in the MOST RANDOM places in NZ too! I have a few photos of some, but not all. Hi, Kate. It is one of the great things uniting Canadians from coast-to-coast: our beautiful unique flag, and perhaps, even some Tim Hortons. Was there a noon-time horn where you grew up in Nova Scotia? I’d love to see and find out where you spotted Canadian flags in New Zealand! Thanks for reading and for your comment! Loved readin your post. It’s been too long since we visited Canada – 1993. Love Vancouver and it’s surrounds. We must visit again soon. The country is beautiful and the people some of the friendliest in the world. Greeting to you on National Flag day.